It instantly upgrades everything, doesn’t it? True, they changed a few other details in the room to make it look more decorated, but the primary, and most noticeable, change is the mirror. 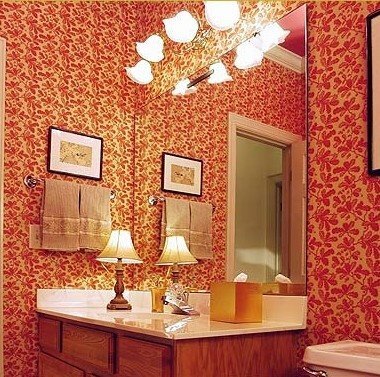 If these makeovers don’t convince you to ditch your plain-Jane bathroom mirrors, I don’t know what would. Now I’m even more eager than ever to get rid of mine. 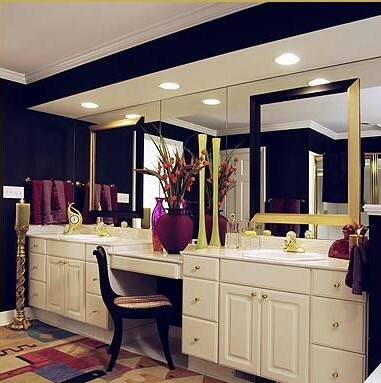 These makeovers were created with a new product called Mirror Mates, which allows you to choose the frame you want for your mirror and easily install it. From what I can tell by watching the How-To video on their website, it looks as easy as sticking them on with adhesive that comes with the frames. 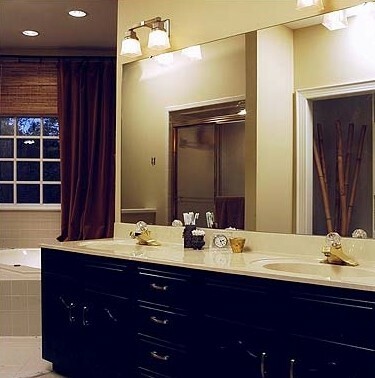 The company was started by Lisa Huntting, who was tired of removing the old mirrors and wanted an easier way to give her bathrooms an updated look. Visit their website for more info! I finally framed that giant mirror in my bathroom–but we did it the hard way, creating our own frames with wood trim. Want to see how it turned out? 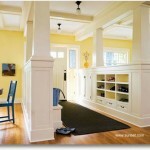 What great before and after photos and an even better link! 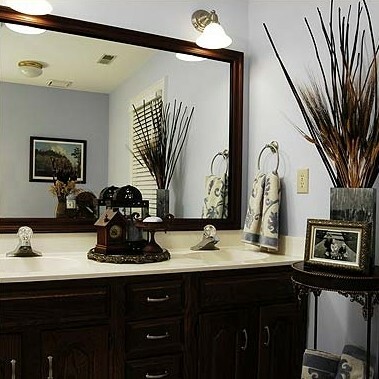 You’ve made it even easier for those who want to do a mirror make-over. I love your site!! Great transformations. 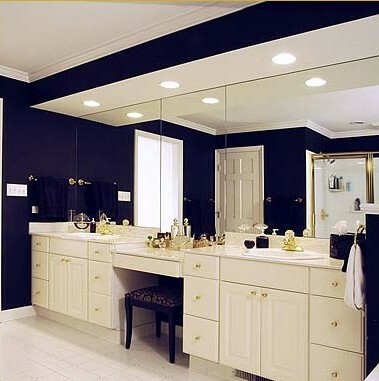 I really dislike the freefloating mirror look…reminds me of the cheap rental apartments in my past, lol. If you want to remove the mirror, its not too difficult. First remove any visible clips holding up the mirror. Then take some picture hanging wire and run it in a “see-saw” motion down the back. This will cut through any adhesive. Voila, mirror comes off. I love using a “normal” mirror over the bathroom sink. It instead of the long “hotel” one. Replacing it was the first thing I did when we moved into this house. There are a few tips to removing it though. It all depends on if it was glued to the wall or put up using brackets. wanderluster is on the right track with the picture wire removal technique. It really works. Very cool! It isn’t something I’ve thought of but once I saw it I thought “oh, yeah, how did I ever live without it”. Great post, thanks! 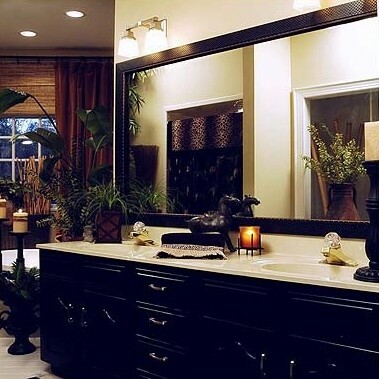 This is such a great idea…..love it….we have just the mirror too……we wanted to do something in this bathroom and this will be great. I’ve tried the mirrormates link here and every link that came up after googling it and no site will come up. Am I missing something or is it down? I’m puzzled as to why so many people seem to be having trouble logging onto the website. Here’s the address for their homepage: http://www.mirrormate.com. Try that (I think I linked to their photo gallery in the post). OK – I am convinced! How do you remove a frame from a bathroom mirror and reframe? I don’t know what kind of glue was used. I used mirror mates in my son’s bathroom and it turned out great. I had removed my daughter’s bathroom mirror and then had to prep and paint behind it. We then had to lug the old mirror and call for a special trash pickup for it. I felt bad knowing it was going into a landfill. I then had to purchase a framed mirror. When the time came to my son’s bathroom I thought that I would try mirror mates. The cost was about the same as the framed mirror for my daughter’s bathroom. It went up very easily with the help of another person and it looks great. The best part is that it is not going into a landfill. 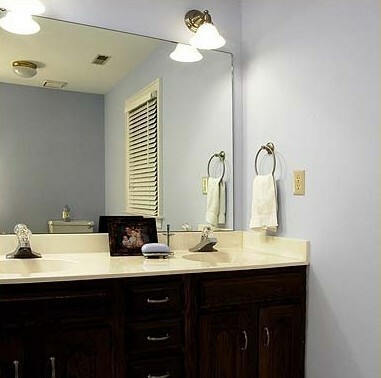 I am getting ready to order another one for my very large mirror in my master bath. 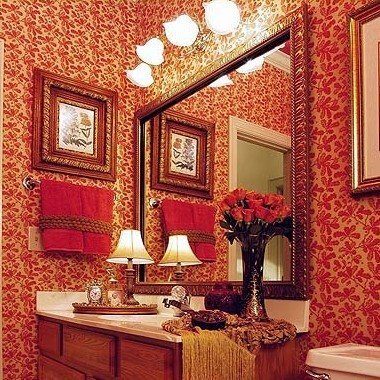 I would like to use mirror mates in my master bathroom, but I have a problem. My husband’s vanity has just one mirror so it will fit great there, but my side has a regular vanity mirror, but then is side by side to another mirror that dips down lower for my make up area. So my question is, how do I put mirror mates around that? I’ve been trying to figure out a solution and I’m not impressed with the one sample of before and afters where you put the frames in the center of the mirrors. What can we do to make this work? A BIG thank you to wanderluster! I was stuck on how to get the plate glass mirror off the wall and the picture hanging wire worked like magic! http://www.reflecteddesign.com does frames for big existing mirrors too. they have a ton to choose from and their shipping is really cheap.